The Garnier Micellar Cleansing Water is one of those products which has been raved about endlessly in the blogging world, and I love it and so do many of my family and friends. When I was last in Boots I spotted this little green topped number, which is specifically for Combination or Sensitive Skin. I couldn't believe I hadn't seen it before and couldn't wait to give it a try. If you haven't heard of or used the Garnier Micellar water before, it is basically a water which, when applied to cotton pads, removes all traces of make up. It is far more effective yet gentle than a make up wipe, and I find it is particularly good for eye make up. As someone who wears a lot of eye make up but has sensitive skin, I find that when using any product other than this water, I lose a lot of eyelashes and my eyes are left looking red raw. I am a huge fan of the Micellar Water and this lives up to the reputation of its pink topped cousin. As someone with sensitive skin, I have fallen in love with this even more than the original. I find that this is even more gentle, whilst still as effective, and doesn't leave my skin feeling as sticky. This does the trick in removing all traces of make up at the end of the day, but I find that it does just have that little extra touch for those of us who suffer with sensitive skin. This is £4.99 in Boots in the UK. 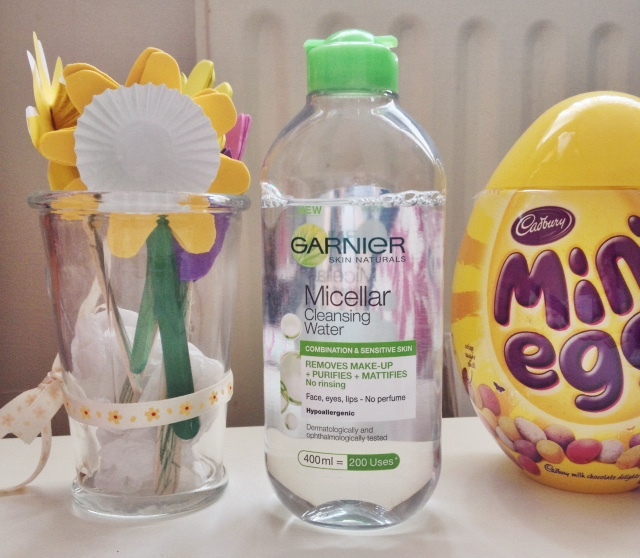 What do you think of the Garnier Micellar Water? If you've tried both, do you prefer this one as well?